.Quiltscapes. : Is this a QUILT? What is the definition of a quilt? Noun: A warm bed covering made of padding enclosed between layers of fabric and kept in place by lines of stitching. 1. A coverlet or blanket made of two layers of fabric with a layer of cotton, wool, feathers, or down in between, all stitched firmly together, usually in a decorative crisscross design. 2. 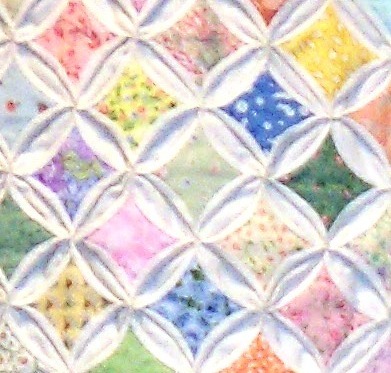 A thick protective cover similar to or suggestive of a quilt. 1: a bed coverlet of two layers of cloth filled with padding (as down or batting) held in place by ties or stitched designs. 2: something that is quilted or resembles a quilt. But quilts are not just bed coverings anymore! What about Art quilts? Painted quilts? Are they still quilts? Seems to me, as long as it is fabric-based and has those three layers joined together with stitching of some kind, then it is a quilt. So here's my latest "quilt" ... has three layers (backing/flannel filler/patchwork top) which I quilted together when I pulled the backing around to the front and stitched it down to bind the edges. It's a 1-1/4" x 38" quilt. And I worked just as hard at the piecing as I do on any of my quilts. I guess I could stitch around each tiny 1/8" block... oh, never mind, guess not! My true definition of a quilt should also include something about "stitched with love" or "A quilt is a warm hug from Grandma..." and there has to be some definition of a quilt that includes blood, sweat and tears, don't you think? 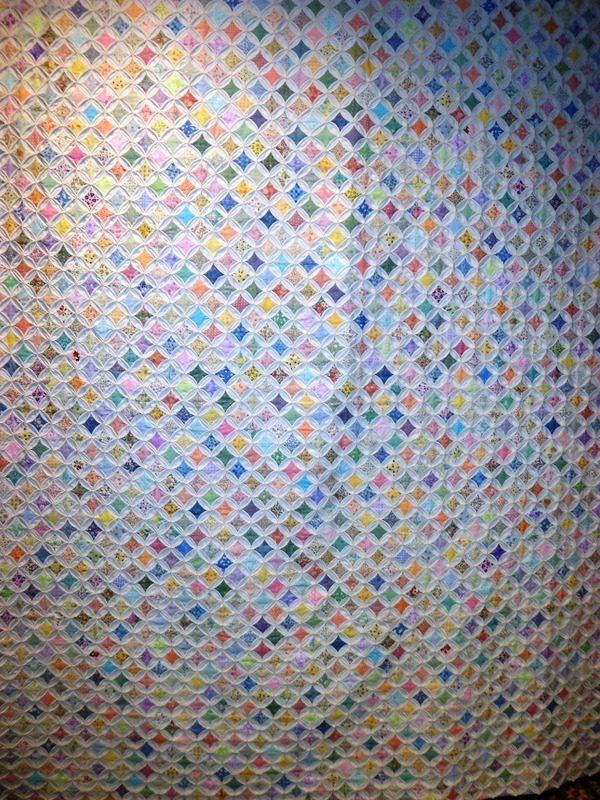 A Cathedral Window quilt is NOT a quilt. 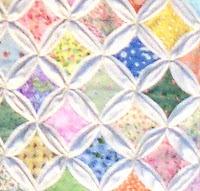 It may have taken her TEN YEARS to make, HAND-STITCHING each little section one little window at a time, but according someone who heard that someone said that The American Quilter's Society had established this fact, a Cathedral Window quilt is NOT a quilt, it's a coverlet. So, what about all those inner layers created by some tricky origami folding then re-folding then stitching back the curve... that's got to be at least four layers, right there... and what happened to all those 47 YARDS of fabric used to create this masterpiece of a....thing?? I don't know about this. I'll have to research a bit. A Cathedral Window (quilt) is one of the things on my WHIMM (works hidden in my mind) list that I plan to make, someday. And even if someone who knows someone who said such-and-such said it isn't a quilt. Is it, or isn't it? You tell me﻿. I'm anxious to know! 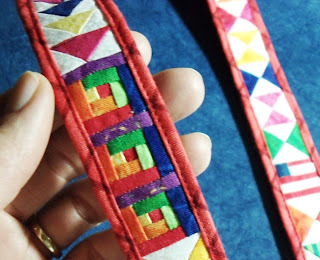 For me, a quilt is more about love than three specific layers. well, I would have to agree that the cathedral window is not a quilt, but a coverlet. Simply because it has no batting. Yo-yo ''quilts'' are also coverlets. Doesn't make it any less spectacular to call it a coverlet though! It's jaw-dropping amazing!!! I consider a Cathedral Window a quilt. We call a pieced top a "quilt top" (not a coverlet top) and its not even layered with anything yet. Your amazingly tiny 1 1/4 X 38" quilt is gorgeous. I thought a Cathedral window block was made by using 2 layers of fabric. Then after making a top of these blocks a backing is put on. Simple preschool math says 2+1=3. Sounds like a quilt to me. I love rules and bend them as often as necessary to further my creative process as my heart and mind lead me. Sounds like this rule is not correct, but at the very least should be bent for this application. That is my serious and thought out answer. I do love your long skinny quilt! Amazing patience girl! LOL...by definitions, yes. by intent, yes. by heart, yes. So, I will go with YES....LOL LOVE the lanyard style quilt!